Another in our ongoing series of occasional reviews of cigars given to us as gifts. Featured this time is the CAO Criollo “Conquistador”, given to me by club Charter member Pat back in December of ‘08. Produced by CAO International of Nashville, this Nicaraguan puro features a dark, rich looking Cuban-seed wrapper and a skillfully tapered torpedo shape. 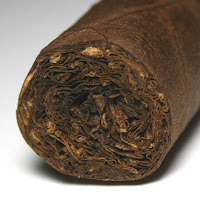 The current Cigar Aficionado rating for it is 88 (June, 2004). As is typical with our reviews, I followed CA's 4-part rating system (Appearance & Construction, Flavor, Smoking Characteristics, and Overall Impression). In the interest of full disclosure, it should be noted that I actually conducted this tasting back in October of ‘09. The holiday season has been busy so I’m just getting around to this posting. With a severe conical-shaped head, it appeared very well-shaped. The wrapper was toothy like a coarse sandpaper. Unfortunately, there were some unsightly ridges beneath the wrapper. The draw was a little firm for my liking, but manageable. The ability of this cigar to burn is where things soon went downhill. Also the smoke produced was a bit thin, undoubtedly due to the firm draw. The flavor started out woody and sweet like hickory chips then it changed to a slightly more pungent cedar with a bit of silage (fermented grain). The second half showed stages of bitterness. Getting back to the burn, it was nothing short of atrocious. The constant relighting and coaxing was an incredible drag. My rating for the CAO Criollo Conquistador is 78. All in all, a very demanding effort just to keep the cigar going; which really hurt the experience. Too bad because there was definitely some complexity to the flavors which probably warrant a second try. Thanks Pat, for the Christmas gift! © 2010 The Cohiba Club - All rights reserved.